We have recently started doing a new treatment to stimulate hair growth: microneedling plus growth factors. This treatment represents the latest step in our quest to work with the body to bring back hair follicles and stimulate healthier thicker hair, without surgery. We know that with the typical causes of hair loss the hair follicle or root, becomes weaker, producing fewer hairs until finally hair stops growing out of the follicle. When that happens, the follicle flattens out and disappears, never to grow a hair again. We used to believe that once the hair follicle was gone, you couldn’t make new ones. You could either become progressively more bald or have a surgical hair transplant to move hair follicles from one part of the scalp to the bare area. About 5 years ago, studies were published showing that platelet-rich plasma (PRP) injections could stimulate the scalp to generate new hair follicles. PRP is produced from the patient’s own blood. We know that PRP is rich in growth factors, which are peptides that we naturally produce in our bodies that aid in healing and growth of the body’s cells and structures. PRP injections in the scalp improve the overall quality of the hair, increase the density of hair growth and increase the number of hair follicles. Results can be seen as early as 3 weeks after starting the treatment. 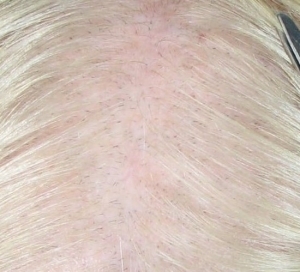 The downside of PRP is the number of injections into the scalp, which is a sensitive area. The recommended protocol involves doing the treatment 5 times, every 2 weeks. If PRP is your only method of restoring your hair (i.e. you’re not using products or laser), you may have to repeat the full course of treatment every 6 – 12 months. My conclusion was that PRP injection was a treatment that worked but wasn’t very comfortable. Other scientists agreed with me and started looking at other methods of delivering PRP into the scalp. The treatment that has received a lot of attention is microneedling. Microneedling involves using a device to create tiny punctures in the skin. In the case of hair restoration, growth factors such as PRP can be applied over the punctures and will penetrate into the skin through the punctures. The equipment we use for microneedling uses sterile cartridges of very fine surgical steel needles and makes the needles go up and down very fast making for a much more comfortable treatment than other microneedling systems. For instance, we found it very difficult to make treatments with non-mechanized microneedling systems such as the Dermaroller, comfortable. Scientific studies supported the effectiveness of PRP with microneedling as a treatment to stimulate hair growth and generate new hair follicles. Now at this point, we have a much more comfortable treatment for the scalp that is proven effective, however I still had a reservation about using PRP, which I’ll try to explain. When I use PRP for a scalp treatment, I take 16 mL of blood, which yields 8 – 12 mL of plasma, of which we use about 3 or 4 mL for the microneedling treatment. We know that the growth factors are most concentrated in a particular layer of the plasma so I discard the layer of plasma that contains little or no growth factors. I went into the Operating Room to see how the orthopedic surgeons were using PRP for their tendon and ligament repairs. They would take 60 mL of blood and use only 2 mL of the most concentrated layer of plasma, to have the highest concentration of growth factors. Compare: I’m using 3 mL out of 16 mL of blood and they’re using 2 mL out of 60 mL of blood. There’s a huge difference in concentration here. And I don’t know exactly what the concentration of growth factors is with either system. But I already have a growth factor serum that I know is 94% concentrated. And I know that it is a natural mixture of all of the growth factors that human cells produce. We already use this serum with microneedling for skin tightening on the face, with beautiful results. So my next question was whether my growth factor serum would be as effective as PRP in stimulating hair growth. We started treating some volunteers and found that they did indeed grow hair with our growth factor serum, and the percentage increase in hair was comparable to PRP treatments, at least 25%. I was one of the volunteers and I’d like to show you my results. They’re awesome! 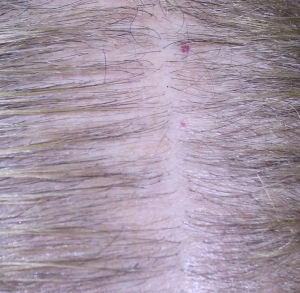 The lefthand image shows my scalp before microneedling. It was taken in 2016 and shows just how severe my hair loss had gotten. The righthand image was taken after my first microneedling treatment. I took a picture before the first treatment but unfortunately deleted it by mistake. Here we’re comparing my results after 1 microneedling treatment (left) and after 5 treatments (right). I’m still due one more treatment to complete my package but I was so excited, I had to share my results now. I cropped all of these pictures to include the red spot in approximately the same area to use as a reference point. 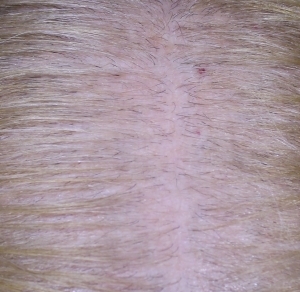 In the 1st image, we see a large area in the parting that has very few blond hairs. The little dark hairs are the new growth that started growing when I commenced using the HLCC hair products. 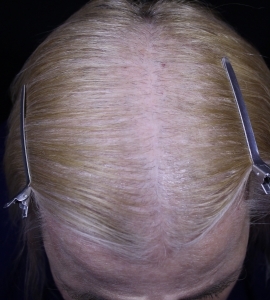 In the 2nd image, we see that my blond hairs are a little denser in the parting area, thanks to HLCC, and we see lots of new dark short hairs, which is the new growth stimulated by the first microneedling treatment. 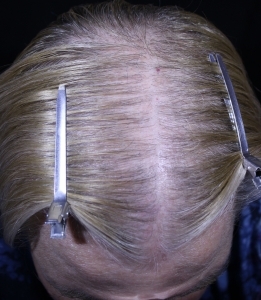 In the 1st image, the parting has no edges, meaning that there is no density of hair growth coming up to edge of the parting. In the 2nd image, there is more of a sense of where the parting is but the edges are not well demarcated, meaning that there is not a lot of density of hair coming up to the edge of the parting. In the third image, we still see some short hairs, meaning that there is still new growth occurring. And we see a much better demarcation of the parting, meaning that there is definitely more density of hair growing up to the edge of the parting. My natural hair colour is a mixture of ash brown, grey and white so those highlights you see on the scalp are actually white hairs (sigh!). 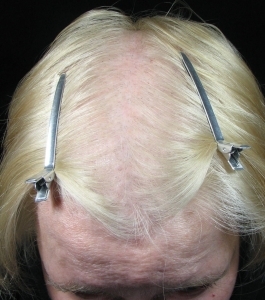 If you are worried about thinning hair, please come and talk to us about the treatments we offer. I would love to give everyone the great results that I have had. I know how bad it feels to be losing hair. Call 905-340-0401 today for a consultation.